One stragegy for detecting the retroreflective vision targets is to use an LED ringlight around the lens on your camera and setting the camera brightness so only the target is visible. 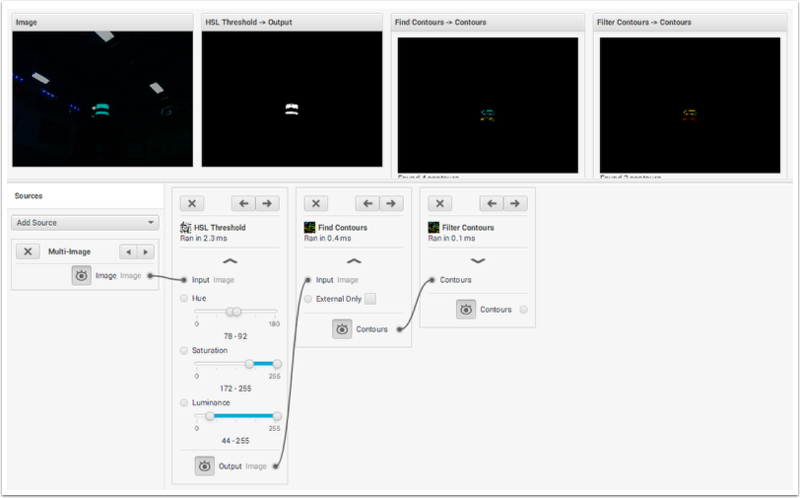 Then you can filter for the LED ringlight color and find contours (connected sets of points) in the image. There are a set of images and the GRIP save file provided by FIRST that were taking this way here. 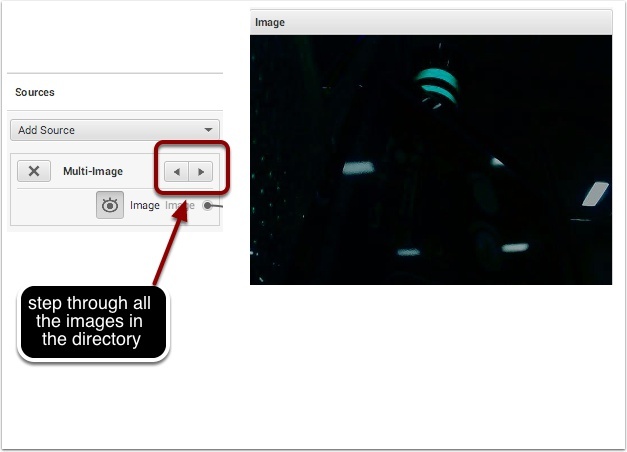 By starting the GRIP pipeline with a multi-image (files) set of sources you can use the left-right arrows to cycle through all the images in a set and make sure that your code is properly tuned to detect just the vision targets. In this image you can see that everything that is not brightly lit is black and the only things visible are the reflected vision targets and some lights that were in the room. But the target is distinctly green (the LED color) and can be differentiated from the ceiling lights. 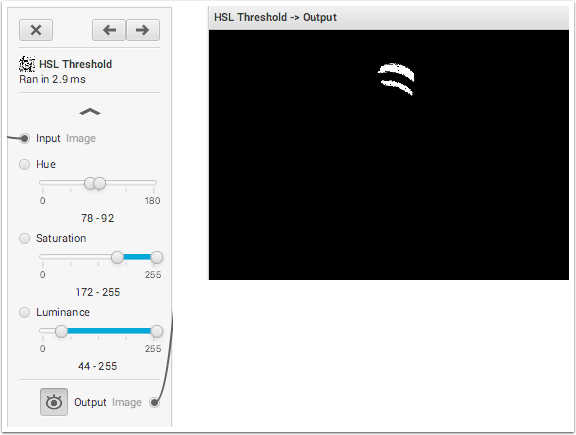 Using an HSL Threshold operation you can filter out almost everything except the vision targets as shown in the following image. The HSL Threshold lets you specify an accepted range of Hue, Saturation, and Luminance values that will make up the pixels in the resultant binary (one bit per pixel) image. The next step is to identify the selected areas that make up the targets. This is done using a Find Contours operation. Contours are contiguous areas of pixels that are lit in the image. Notice that 9 contours were found in the image because of noise tha other other very small areas that were selected. The idea is to come up criteria to reduce th number of false positives. 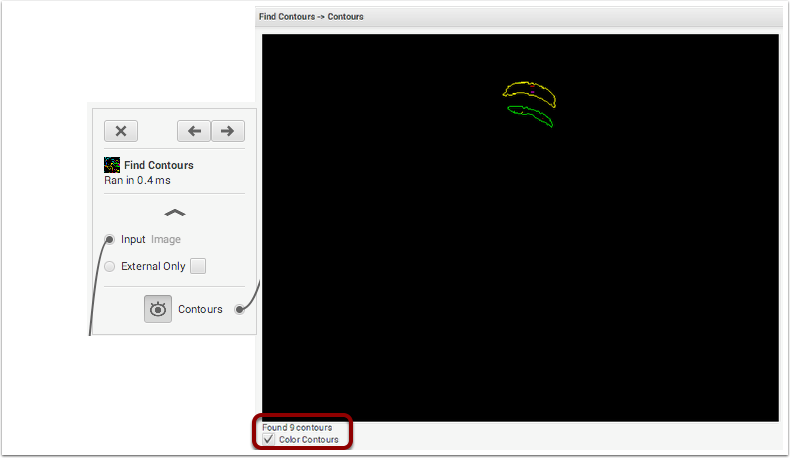 You can reduce the number of extraneous contours found a number of ways. One is to filter on the area of the contour. In the following example, a minimum area of 125 pixels was shown. The filtered contours are shown in the next image. 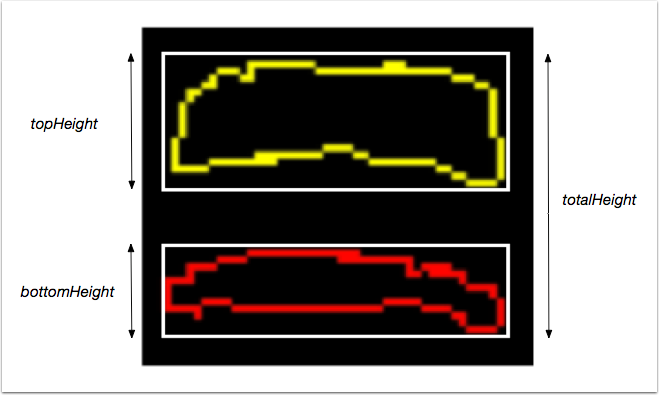 And now there are only 2 contours remaining representing the top and bottom piece of retrorecflective tape. Here is the full GRIP pipeline that is described in this article. Use the following sample heuristics as a starting point that you can apply to score your found targets. Correct for the perspective distortion using OpenCV. 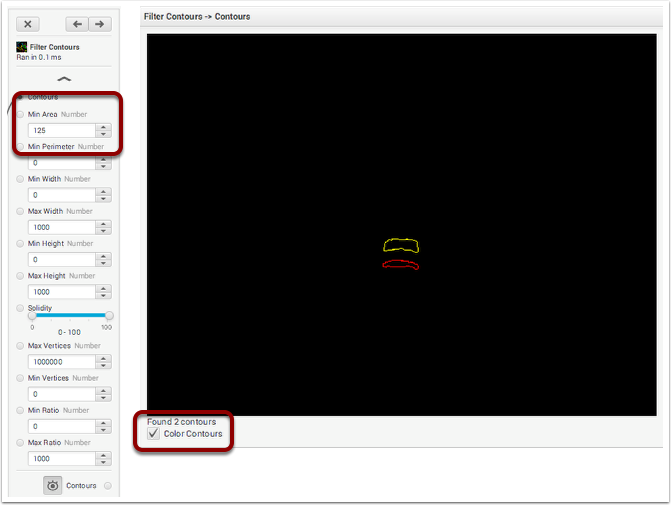 To do this you will need to calibrate your camera with OpenCV as described here.